Persistence Market Research presents a comprehensive report on the global endoscope repair market titled ‘Endoscope Repair Market: Global Industry Analysis (2013-2016) and Forecast (2017-2025)’. The report begins with an executive summary that states the important market numbers related to the global endoscope repair market such as the market values for the year 2017 and 2025 and the most attractive product type, region and modality type in this market. The executive summary also gives a concise list of drivers, restraints and trends in the global endoscope repair market that are dealt in detail in another exclusive section of this report. The executive summary also lists the prominent players operating in the endoscope repair market. In another part of the executive summary, the global endoscope repair market value share for the year 2016 by product type, by modality type, by service provider and by facility type are stated. There is also a concise and yet informative Persistence Market Research analysis on the overall market approach of the leading players operating in the global endoscope repair market and information is also given on the target segment and the target countries that are most lucrative in this market. The differentiating strategies of the leading market players are also highlighted here. At the end of the executive summary, there is a diagrammatic representation of the various stages of the global endoscope repair market – the introduction phase, growth phase, maturity phase and decline phase. A section of the report is devoted to the global endoscope repair market definitions and product introduction. This is followed by a detailed section on the market dynamics of the global endoscope repair market. This exhaustive section talks about the macro-economic factors that play a part in shaping the endoscope repair market. Along with this, there is an exhaustive explanation about the drivers, restraints and opportunities applicable in the global endoscope repair market. This is an important section of the report as it contains a detailed explanation about the factors that encourage the growth of this market as well as the factors that hamper the growth of this market. Besides this, weightage of impact of the forecast factors is also given in this section. After the market dynamics section, there is a section of the report which lists the endoscope installed bases by major countries. The regional subsections of the report contain important market information in the form of endoscope repair market size (US$ Mn) forecast by country. Also, these sub-sections of the report contain important figures in the form of BPS analysis, year-on-year growth rates, absolute dollar opportunity and market attractiveness analysis. In addition, the regional market dynamics in the form of regional drivers, restraints and trends is also given. An entire section of the report focuses on the competition landscape of the global endoscope repair market. This competition landscape gives a dashboard view of the key companies operating in the global endoscope repair market along with their important information and broad strategy adopted to stay as leaders in the global endoscope repair market. Each of the leading companies is also profiled individually and important information about the company such as company details, company description, product portfolio along with key developments concerning the company and strategic analysis is presented. A SWOT analysis of each leading market player is also presented, which gives detailed information about the strengths, weakness, opportunities and threats that the company is dealing with. This competition landscape is the most important section of the report as it imparts a deep understanding of the leading companies operating in the global endoscope repair market. Last but not the least, important information is given in the form of global endoscope repair market analysis (2013-2016) and forecast (2017-2025) by region, by product type, by modality type, by service provider and by facility type. Overall market size has been analyzed through historical data, primary responses, and public domain data. Revenue of companies in the endoscope repair market has been benchmarked to ascertain the market size for the base year. Macroeconomic indicators such as GDP and industry growth have been considered to forecast the market size over the forecast period. The historical growth trend of end-use industries, market participants’ performance, as well as the present macro-economic outlook has been taken into consideration for estimating the overall market trend forecast. This data is then validated using the triangulation method and is extensively scrutinized using advanced tools to garner quantitative and qualitative insights into the global endoscope repair market. Persistence Market Research forecasts the global endoscope repair market to grow from US$ 976.8 Mn in 2016 to about US$ 1,650 Mn by 2025 end. This represents a CAGR of 6.0% over the forecast period 2017–2025. 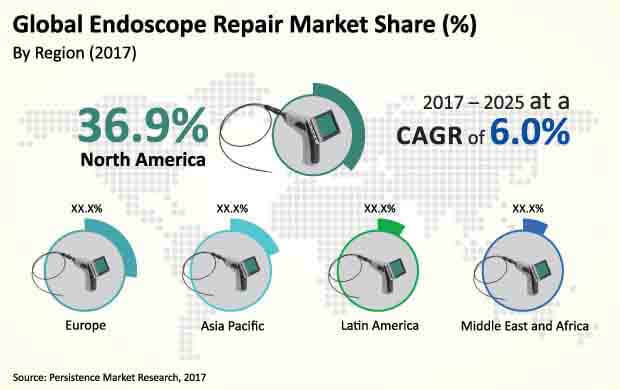 The global market for endoscope repair is estimated to represent absolute dollar opportunity of US$ 66.6 Mn in 2018 over 2017 and incremental opportunity of US$ 613 Mn between 2017 and 2025. Increasing demand for minimally invasive procedures – also known as endoscopic procedures – will have a high impact across the forecast period. This can be attributed to the increasing incidence of diseases and an ageing population. Minimally invasive procedures have several advantages for doctors as well as patients. Minimally invasive procedures are safer as compared to open surgeries as they involve small incisions in the patient’s body, unlike open procedures. The advantages include reduced blood loss, lower chances of infection, faster recovery time and fewer surgery marks on the body. Minimally invasive procedures reduce the risk of arterial fibrillation and are less time consuming. These advantages have garnered a lot of consumer attention and hence drive the endoscope repair market. The trend of a rising demand for endoscopic procedures is expected to lead to growth of the endoscope repair market over the forecast period. The rising prevalence of colorectal and gastrointestinal diseases has resulted in an increase in endoscopy procedures for detection and treatment purposes. According to the World Health Organization (WHO), the incidences of benign, malignant gastrointestinal (GI) diseases and colorectal complications are rising worldwide in elder patients. As per WHO, in 2008, elder patients constituted the greatest proportion of colorectal cancer diagnosis with an incident rate of 247.6/100,000, esophageal cancer diagnosis with an incident rate of 23.3/100,000 and gastric cancer diagnosis with an incidence rate of 40.8/100,000. The elderly have also increased incidences of other diseases such as pancreatic and biliary diseases with gallstones. Thus, for the detection of cancer and tumors, doctors and patients prefer endoscopes due to the safety and efficacy of endoscopic procedures. This propels the demand for endoscopes and drives growth of the endoscope repair market. Inadequate healthcare infrastructure in emerging markets may restrain growth of the endoscope market. The lack of proper development and implementation of clinical practice guidelines and dearth of skilled labor in developing countries such as China, India and Middle East and African countries hampers the demand and application of specialized endoscopy devices and hence hinders growth of the market. Lack of a proper regulatory framework in emerging markets is also hindering revenue growth of the endoscope repair market. North America dominated the global endoscope repair market in terms of revenue in 2017, and the trend is projected to continue throughout the forecast period. North America is the most attractive market, with an attractiveness index of 1.8 over the forecast period. Revenue from the North America endoscope repair market is anticipated to increase at a CAGR of 5.9% over 2017–2025, to reach more than US$ 605 Mn by 2025. Europe is expected to be the second most lucrative market in the global endoscope repair market with an attractiveness index of 1.4 during the forecast period. In endoscopic procedures, the diagnosis and treatment of diseases is done through natural openings of the body and sometimes through small incisions taken on the body. Attributing to the presence of small or no incisions, the chances of developing an infection are reduced, as compared to conventional procedures where large incisions are required and the chances of infection are more. Endoscopic procedures also reduce healthcare expenditure significantly. These procedures have a short procedure time and a low risk of complications and hence, patients have a shorter hospital stay with lower pre- and post-operative costs. These benefits have resulted in the growing acceptance of endoscopic procedures, which is anticipated to boost demand and drive growth of the global endoscope repair market. Integrated Medical Systems International, Inc.